Dallas, TX – January 2015 – EMBED, a leading provider of Debit Card and Point of Sale Systems for the amusement and family entertainment industry, announces the recent deployment of their system at Tilt Studio in Altoona, PA. Owner Nickels and Dimes utilizes Embed’s wireless debit card system for the cashless, ticketless operation of games, with Embed’s Redemption Pro used to manage the extensive merchandise display. The Embed Point of Sale is used for the facility’s food & beverage sales as well as party and group functions. Additionally, the Online Party Planner allows customers to quickly and easily book parties and make deposits from the comfort of their own home. Tilt Studio in Altoona is the fifth Nickels and Dimes location to install the Embed system. Embed was previously deployed in Rink Side Sports in Gurnee, IL, and the Tilt Studio locations in Katy, TX, Joplin, MO and Marlborough, MA. 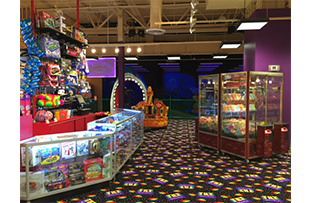 Tilt Studio features dozens of arcade games, redemption games, mini bowling, black light mini golf and laser tag. For more information on Tilt Studio, visit them on the web at www.tiltstudio.com.